The first question is what is a spot? Is it dirt, a spill, wear, a permanent stain? You might be able to determine if the spot you are dealing with is correctable. Dampen a white cloth with water and rub it on the area. If the color of the spot transfers to the cloth, it may be possible to clean the area. Whether you can clean it yourself may be another matter altogether. 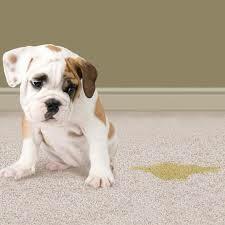 Pet urine, feces, or other biological spots require special treatments to ensure your safety. Sometimes the color of the spot will transfer to the cloth. However, the spot itself may not cleanable. Red wine or Kool-Aid, for example, will transfer to the cloth but can permanently stain your carpet or furniture. If the color of the spot does not transfer to the cloth, you are dealing with a more difficult stain, requiring the attention of a professional. Prestige System can determine what kind of spot it is, and fix it. For general purposes, we will refer to biological spots as Pet Spots, but babies have accidents too, as do all of us. Blood, vomit, and toilet overflows fall into this same category. These spots require special care. 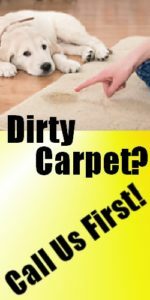 It is not enough to get the offending substance off your carpet or furniture. A deeper clean is necessary to remove the threat of biological contamination and potential mold accumulation. Carpet linings and paddings need to be addressed. In the case of pets, a deep cleaning is necessary to remove the odor and hormonal traces to help prevent the pet from continuing to mark the area. Prestige Systems uses natural enzymes to remove odors, and help deter territorial marking. We can remove pet body odors, vomit, feces, urine, and other odor sources. Our process is safe for humans, pets, stain resistant carpeting, and the environment. At Prestige, our goal is to clean your living and working spaces to help improve your health and the health of your family. Some substances create permanent stains. Wine, paint, and some make-up products, are some of the stains that cannot be cleaned and will require other forms of correction. Bleach is particularly nasty. Technically, the spot is quite clean, but the color of the fabric has been removed. Cleaning will not put the color back. Prestige Systems can determine if your spot can be cleaned or if another course of action is required. CLICK HERE for information on Carpet Repair and Carpet Dyeing. Carpet is made of fabric – fabric you walk on all the time, and clean only occasionally. Overtime, the fibers of the fabric becomes scratched and worn. The dirt and grit from traffic is so ground in, it becomes permanent. Think of your favorite pair of jeans. Overtime, the material becomes thin and worn and no amount of washing is going to make the jeans look new. 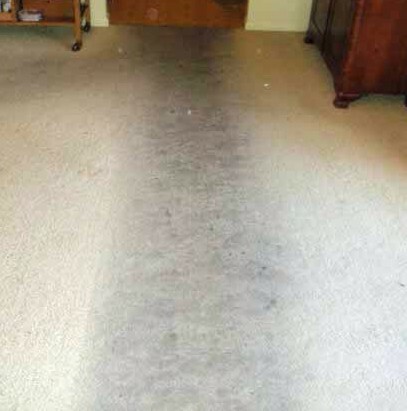 Prestige Systems can clean your worn areas as well as possible, but no one can make those worn areas look like new. We can help you determine if the worn areas can be salvaged, or if other corrective procedures are necessary. 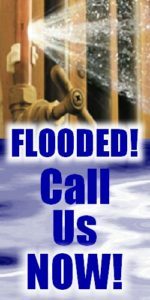 CLICK HERE for information Carpet Repair. Prestige Systems – a local, minority owned business, 29 years and still going! Prestige Systems – Licensed, Bonded, and Certified – we can solve your problem. Prestige Systems – Simply the Best!